Sarandel's Carnival — A roadside carnival hailing from Auridon and ran by Sarandel. These side quests count towards the Grahtwood Adventurer achievement. For Dominion storyline quests which also contribute to this achievement, please see Grahtwood Quests. 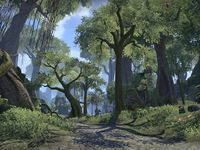 Bosmer Insight: Go on a spirit journey and learn the ways of the forest. Brackenleaf's Briars: Join the ranks of Brackenleaf's Briars. Carnival Conundrum: Help a carnival get back to business. Forever Bound: Free an Imperial spirit from his own binding ritual. A Little on the Side: Recover the goods needed for the inn's "side business". Lost Treasures: Find the inn workers who are lost in the marsh. Luck of the Albatross: Help an Altmer captain overcome a mutiny. Passage Denied: Deactivate the Covenant portal in the depths of an old ruin. Scars Never Fade: Investigate the Argonian refugees in the Gray Mire. A Silken Garb: Rescue a Bosmer from a spider pit. The Wandering Minstrel: Help find a lost minstrel. 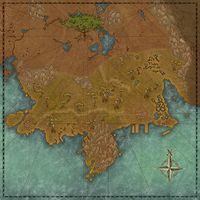 ​ Southpoint 5 You've freed Southpoint from the influence of the Daedric Prince, Sheogorath. This page was last modified on 10 November 2017, at 19:30.